If you were to come spend and evening with me and my husband, Taylor, I'd give it about an hour before you started to realize something about me: I am sooooooo bossy! But usually, I don't realize I am being bossy until the words are already halfway out of my mouth. And then it's too late. I can either play it off as a joke, which usually doesn't work since the people I allow myself to be bossy towards are the ones who know me well enough to know it wasn't a joke. Honestly, I know a lot of women who have domineering personalities. Whether it's because they've lived alone and have become very independent, have a husband who won't step up to help, or whether it just comes naturally to them, there's something inside these women that causes them to demand things of those around them, and then to get mad when the task isn't done immediately. If you identify as one of those women, let's talk about why this is a bad thing, and some practical steps we can take to fix that. 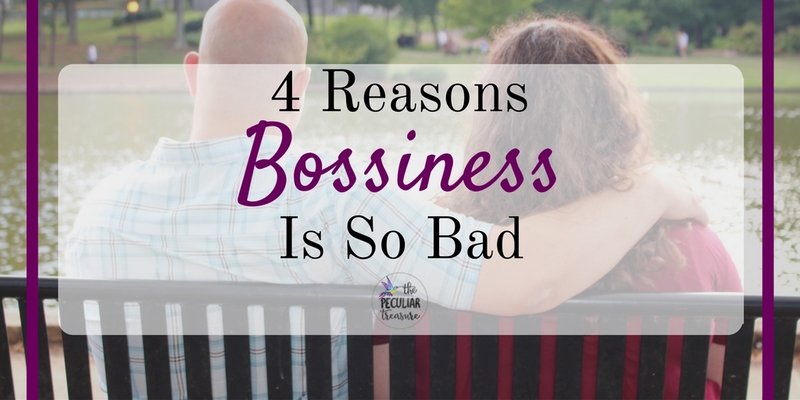 When I boss my husband around, what is it I am really doing? By telling him what to do and how to do it, I can easily make him feel that I think his way is stupid and my way is best. This, in turn, can make him feel like I don't think he can do anything right. My husband is a very smart man, and there are lots of things he does well, so to make him feel otherwise would break my heart. I touched on this a little bit already, but bossiness makes it seem like I think that my way is always the best. It makes me seem as though I think I am the only one who knows how to accomplish the task at hand, and that I think I have complete authority to tell everyone else how to act. Not only is this a delusion that us bossy ladies suffer from, but it also make us seem completely arrogant. Proverbs 21:9 says that "It is better to live in a corner of the housetop than in a house shared with a quarrelsome wife." Seriously, a quarrelsome (bossy, or nagging) wife is such an obnoxious thing that it would be better for a man to live in the attic than have to deal with his wife. OUCH! I never want to be so bossy that my husband wants to get away from me. I don't want to be so obsessed with control that I push the ones I love away. In Galatians 5:22-23, the Bible talks about the fruit of the Spirit. Two of which are self-control and gentleness. And since the fruits of the Spirit are character traits that we should be growing in as Christians, it troubles me when I realize that bossiness is the opposite of how I should live. Dictionary.com says that the word gentleness "suggests a deliberate or voluntary kindness or forbearance in dealing with others". Where gentleness says, "let me listen to you and hear what ideas you have", bossiness says, "I want what I want and I want you to do what I say". Likewise, self-control means being able to restrain our actions and emotions when need be, but bossiness is often a knee-jerk reaction that comes with being in the habit of telling others what to do. It all sounds a little harsh, right? And how are we supposed to fix this issue when we've been living this way for so long? Is that even possible? No matter how little help you get, no matter what you would rather be doing, focus on helping and serving others all week. Don't ask (or tell) anyone to do anything for you. Instead, ask how you can help them. And do it. After a while, serving will become habit and a lack of bossiness will become normal. Spend a little bit of time every day reading over "the fruit of the Spirit" (Galatians 5:22-23), and other passages in the Bible that talk about what it means to be godly. Read the story of Martha and Mary in Luke 10:38-42. The point? Be focused on godliness, which includes gentleness. The more you focus on that, the more aware you will be when you start to get, um, "aggressive". 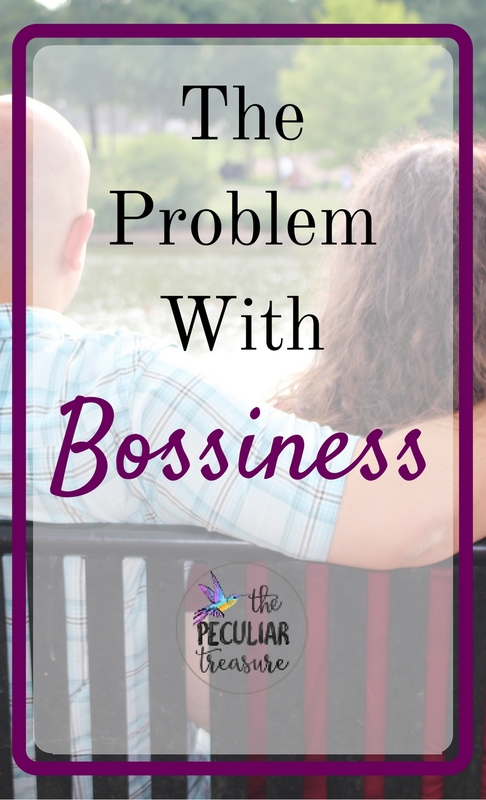 Have you seen bossiness create division or hurt in your relationships with others? Does it break your heart to break God's heart? Reflect on these things. Don't spend time beating yourself up- Ain't nobody got time for that- but rather, spend that time recognizing what bossiness causes versus what gentleness causes. Since you already know which outcome you like best, this will help you decide against bossiness as it comes to you. So there you go, friend. I hope you are encouraged to overcome bossiness and be the gentle, self-controlled person you are capable of being. Did you find any of these tips helpful? Do you have any other tips you'd like to share? Comment below! I so admire your honesty on this! I am bossy sometimes when it comes to my husband. I guess maybe that's really nagging, but I love that your practical advise to overcome bossiness. I'm definitely a bossy person. In some ways it just comes naturally to me, I know what I want and I let people know it. Sometimes, i definitely need to dial it back though! I know that I am bossy! It is soo hard sometimes though! Me & my mom don't have the normal "Mother-daughter dynamic." In our case, the roles are reverse, where I'm more like the responsible parent, and she's like the child... so many times I am bossy but I don't try to be, I just feel like I know best. These are great tips you've provided, I will definitely try to implement some of them, starting today! I do feel there is a time and place to be bossy, for you and for him. Occasionally someone does need to step up and take the lead and that might require bossing the other one around. I think it depends on the intention behind it and how it's done. That is an excellent point and I completely agree. There are times that we need to be bossy, but I know for me, I am ALWAYS bossy, and I also know I am not the only one who is like that. There's a big difference between being bossy in a very important situation that will only work out well if we get a little more aggressive in our approach, versus me telling my hubby exactly how he should wash the dishes, vacuum the floors, etc. Yes Yes Yes! This doesn't mean we need to be a doormat either but there are better ways to ask for something than to just be bossy about it! OUch! You just stepped on my toes! But thank you. I need those reminders. I had the privilege of hearing John Maxwell speak yesterday and he was talking about intentional living and how to value people and add value to people's lives. I think that goes right along with this. I'm not adding value when I'm being bossy. Thank you for sharing! Ugh-this is so hard! I find that I can quickly go from trying to be helpful to being SUPER bossy. This article is so good!